Dine Brands Global Inc’s (NYSE:DIN) IHOP name change is nothing to worry about. The IHOP name change to IHOb is simply the company’s way of promoting a new item on its menu. That new item is burgers. The breakfast chain says that it is expanding out its offerings to include these items for lunch. To be more specific, the chain is now selling what it calls Ultimate Steakburgers. These burgers are only a limited-time promotion, as is the IHOP name change. The burgers start at $6.99 and come with unlimited fries and a drink. The following are IHOP’s new Ultimate Steakburgers and its official descriptions for the menu items. “Big Brunch — IHOb knows how to put breakfast on a burger. The Big Brunch Steakburger includes IHOP’s custom-cured, hickory-smoked bacon, a fried egg, a crispy browned potato, American cheese and a delicious new signature burger sauce that compliments the savory flavors. Cowboy BBQ — This may be how the West was won. This sky-high Steakburger includes two thick, crispy onion rings, custom-cured hickory-smoked bacon, American cheese, lettuce, tomato and mouthwatering tangy BBQ sauce. Jalapeño Kick — For those who like a little excitement in their lives, there’s the Jalapeño Kick Steakburger with a spicy blend of sautéed jalapeños, Serrano peppers and onion, custom-cured hickory-smoked bacon, Pepper-Jack cheese, lettuce, tomato and jalapeño mayo. Mushroom & Swiss — A match made in burger heaven with a blend of sautéed mushrooms and onions, Swiss cheese and creamy mayo. The Classic — Truly a burger classic…melting American cheese, lettuce, tomato, red onion, pickles and the brand’s new signature Steakburger sauce. The Classic with Bacon — Only bacon can improve on an American classic, which is made with custom-cured hickory-smoked bacon, melting American cheese, lettuce, tomato, red onion, pickles and the brand’s signature burger sauce. Now that we know the IHOP name change isn’t a permanent one, maybe everyone will cut the chain some slack. The responses to the name change when it was announced last week were mostly negative. 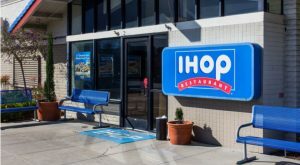 Article printed from InvestorPlace Media, https://investorplace.com/2018/06/ihop-name-change-is-a-burger-promotion/.